Baltimore City Councilperson Ryan Dorsey got a call from Councilperson Brandon Scott Saturday evening, asking if he’d join the entire council to call for Mayor Catherine Pugh’s resignation. City Council President Bernard “Jack” Young acting as mayor ex officio, did not sign the statement. Pugh is at the center of an ongoing scandal over the sales of her “Healthy Holly” children’s book series to the University of Maryland Medical Center, as well as other organizations such as Kaiser Permanente and Associated Black Charities in what appears to be an elaborate exchange for political favors. The money made off of sales of these janky children books—many of which cannot be accounted for at all—is currently nearing one million dollars. One week ago, Pugh announced she would be taking a leave of absence to recover from pneumonia—the same day Governor Larry Hogan requested an investigation into the mayor’s finances. A top aide to Pugh, James T. Smith Jr. resigned on Friday. Just before noon today, Pugh’s office responded to the call for her resignation. Dorsey, along with Councilperson Zeke Cohen had already called for Pugh to resign last week. The last time a mayor in Baltimore endured a similar scandal, it was Sheila Dixon, who did not resign only resigned later on as part of her plea deal (she plead guilty to misconduct in office, felony theft, and misdemeanor embezzlement). Many including Dorsey, accused Pugh of staying in office to use her resignation as part of a negotiation if—or perhaps when—she is charged with a crime. Dixon herself said the upheaval caused by “Healthy Holly” is unprecedented—despite its echoes of her own scandal. “I have been meeting and looking at it but I hadn’t made a decision on if I am or not. And yes, I get a lot of support from people in this city despite what I went through and I think it’s because people not only see and felt my love for people but they also saw results,” Dixon said. Scott himself has been rumored to be planning a run for mayor. He did not comment on his plans today. Baltimore is a city with a strong mayor system of governance in which power leans heavily toward the executive branch. This means the mayor has a lot of power when it comes to appointments being made, money being spent, and laws being passed. 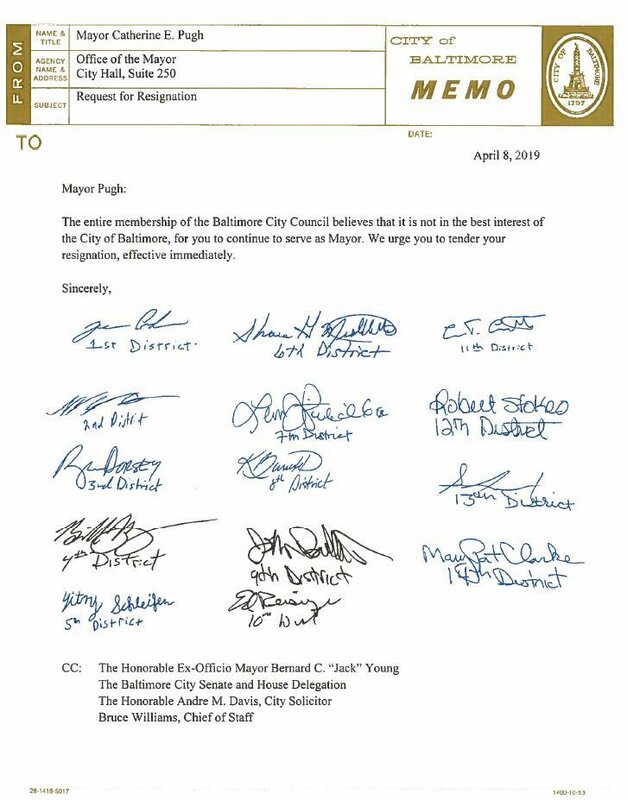 So like many bold statements by council, the request that Pugh resign is well just that, a request. “We had to make clear that she’s the only one that thinks that could possibly be acceptable,” Dorsey said. On March 25, Councilperson Bill Henry said aloud to WJZ reporter Paul Gessler what was being whispered throughout City Hall: Coming out against the mayor is politically unwise—again, especially in a strong mayor city. Two weeks later, “Healthy Holly” keeps growing and in that sense, the entire Council asking Pugh to resign is significant. Dorsey added that the request for Pugh to resign introduces a larger conversation about Baltimore’s need to fix the imbalance of power. It is one thing to be a strong mayor city, it is another thing to be a strong mayor city when that mayor is embroiled in a still-growing scandal. Dorsey has been working on three laws related to whistleblower protection and ethics—one of which was inspired by former Baltimore City Police Commissioner Darryl De Sousa and others in the police department failing to file ethics forms. Pending some sort of last-minute legislation from Annapolis sometime today (today is the final day of General Assembly) that would give city council the power to remove the mayor, or allow state legislatures the power to remover her themselves, resigning is purely Pugh’s decision. “She could try to come back, but I gather that the will to work under her leadership has significantly waned, even with people who, the last two years, have directly reported to her,” Dorsey said. Baltimore Beat relies on support from readers. If you like the work we do, have not already subscribed, and have a few bucks to spare please subscribe to our Patreon.